A girl is the most beautiful part of Gods creation. She starts compromising at a very tender age. She sacrifices her chocolates for her brother. Later she sacrifices her love for just a smile on her parents face. She sacrifices her full youth for her husband and children without complain. And finally her life ends up only by compromising for others happiness. She is that creature of God who no one can compete. Respect every girl/lady in your life. You will never know what she has sacrificed for you. But in spite of the recognition, still the girl child stands in the front-line of all forms of discrimination, stereotypes, and child abuse, still voiceless. Tomorrow, October 11, 2013 is the celebration of the International Day of the Girl. As part of their global effort to promote the importance of girls education and to the rising need for empowering women Intel, Plan International, and the Asian Development Bank will screen the documentary film “Girl Rising: Educate Girls, Change the World” at various community areas nationwide starting October 11. “Girl Rising” is a groundbreaking film directed by Academy Award nominee Richard Robbins, which tells the stories of 9 extraordinary girls from 9 countries. With voice performances by Anne Hathaway, Cate Blanchett, Selena Gomez, Liam Neeson, Priyanka Chopra, Chloe Moretz, Salma Hayek, Alicia Keys, Freida Pinto, Kerry Washington and Meryl Streep, “Girl Rising” showcases the strength of the human spirit and the power of education to change the world. Despite efforts by the government and organizations to ensure the protection of children and to provide for their special needs, more help is needed to uplift the situation of children in the Philippines because of widespread poverty, especially in the rural areas, and social inequality. According to a recent study by Plan International, girl children from poor families are disadvantaged and fall prey to child labor, exploitation and lack of access to basic services primarily because of their status in life. Advocacies and campaigns that benefit women and children still need to be deepened and shared with the vast public. By documenting moving examples of how education can help fight gender inequality, promote girls’ rights and lift millions out of poverty, “Girl Rising” complements Plan International’s global five-year campaign, Because I am a Girl (BIAAG). “Since its conception in 2012, our BIAAG campaign is designed to create sustainable projects in developing countries like the Philippines and to give girls access to clean water, food, healthcare, education, and protection from violence and exploitation. We are optimistic that the screening of “Girl Rising” will promote awareness on the need for education as a means to equip, enable and empower girls of all ages to acquire the assets, skills and knowledge necessary to be successful in life,” said Carin Van der Hor, Country Director, Plan International. Plan International has served the Philippines for about 52 years and continues to develop projects that address key issues affecting children. “Most developing countries in Asia and the Pacific have earned high marks for a dramatic rise in primary education enrollment rates over the last decade, but daunting challenges remain, as the gender gap, especially in secondary education, is still very large,” said Shireen Lateef, ADB’s Senior Advisor for Gender. With more than $8.2 billion in loans and grants to the education sector over the past 40 years, ADB has a long track record in assisting its developing member countries achieve the goal of quality education for all. Despite these efforts, millions of girls in the region have limited or no access to education. As a founding strategic partner of 10x10, the organization that created “Girl Rising”, Intel is proud of the film and of the global social action campaign that accompanies it. Intel believes that education is a fundamental right for everyone, and that broader access to education for girls and women will significantly catalyze social progress and help drive worldwide economic growth. Intel has worked for decades to improve education globally, and has invested more than $ 1 billion on campaigns that aim to improve education in more than 60 countries over the past decade alone. Here is a sneak preview to the movie Girl Rising. Intel’s global and local partnerships and programs emphasize technology and digital literacy to accelerate change, improve lives and transform economies. Some of Intel’s successful education campaigns in the Philippines include the Intel Teach Program, which has trained over 132,000 teachers in the country, Intel Easy Steps, which trains adult learners on digital literacy skills, and the Intel International Science and Engineering Fair, which gives young scientists the chance to showcase their projects and ideas to the world. To raise awareness on this noble advocacy for women and girls, and reach out to more people, kick-off screenings will be held at the Jose Rizal University in Mandaluyong City (October 11, 1:30 – 3:00PM), Munoz Covered Court, Betty Lou Daul Center (BLDC), Batasan Hills in Quezon City (October 11, 3:00 – 5:00pm), Children International Youth Health Corps, BLDC (October 13), Children International Merry Meal Time Facilitators, BLDC (October 26), Children International Junior Librarians, BLDC (November 16) and Children International Aflatoun Club Facilitators, BLDC (November 30). 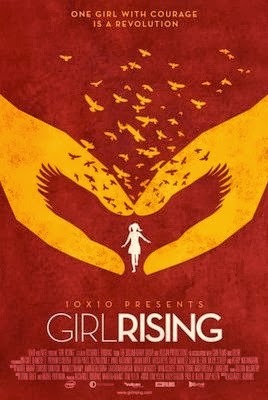 For more information on the film, please go to http://girlrising.com/#66-million-girls or email girlrisingph@fit-ed.org. or www.10x10act.org. Plan International is a global children’s development organization that works in 69 countries across the world. Plan’s vision is of a world in which all children realize their full potential in societies that respect people’s right and dignity. Because I Am A Girl is Plan’s global campaign to fight gender inequality, promote girls’ rights and lift millions out of poverty.